Australians have come to the defence of PM Malcolm Turnbull after a photo of him holding his grandchild and a beer became a topic of much discussion. 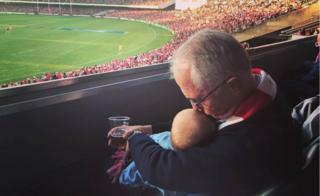 It began innocuously enough: Mr Turnbull shared the photo of himself with his young granddaughter at an Australian Rules football final in Sydney on Saturday. The image was posted on his Facebook page alongside the caption: "Multitasking at the footy." But it prompted some comments criticising Mr Turnbull over the presence of the beer. "Disgraceful holding a child with alcohol in hand!" wrote Marg Walker. Another criticised it as "irresponsible", while one person said they found it "disgusting to see people breathing grog all over baby's [sic]". The objections gained a wider audience when they were picked up by national media outlets. Descriptions of it ranged from a "minor storm" to a "huge backlash". However, as quickly as the criticism emerged, so too did those defending Mr Turnbull as having done nothing wrong. "What a beautiful photo. Mr Turnbull has every right to nurse and enjoy cuddling his grandchild," wrote Jan Robertson. Caroline Overington wrote: "This is absurd. The PM is taking good care of the baby. It's a beautiful shot." Others pointed out that it is common to sensibly enjoy an alcoholic beverage in Australian sporting stadiums. Some wondered what would have happened if Mr Turnbull had been pictured clasping a non-alcoholic beverage, such as a cup of tea. The list of Mr Turnbull's defenders even grew to include his political rival, opposition leader Bill Shorten. One government Senator, Matthew Canavan, responded with his own photo. Another political opponent, Greens Senator Sarah Hanson-Young, told Channel Seven: "If anything this has made the prime minister look a bit more personable to the public." Some said if there was any criticism of the photo it should be that it was potentially stage-managed. The nation's two dominant football codes, Australian Rules and rugby league, attract huge attention during their finals seasons in September. By Monday, much of the anger was being directed at those who had sparked the discussion. "[The photo is] lovely, and all these keyboard warriors need to get a life!" wrote one commenter, Fiona Deegan. The sentiment was echoed by Mr Turnbull, who played down the debate in his first interview for the week. "I think it's the craziness of social media when you see things like that," he told local radio station Triple M.
"As long as you're comfortable in your own skin and you're just being yourself, being natural, that's all you can do."